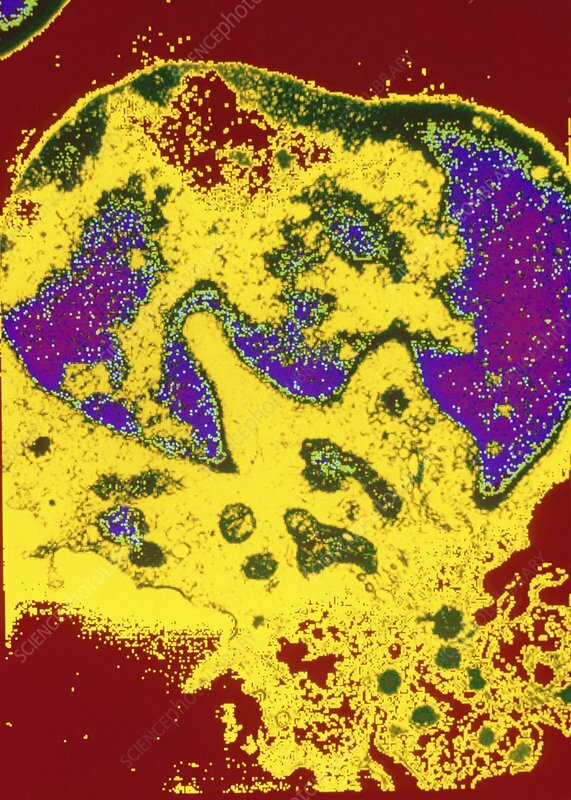 Digitised-colour transmission electron micrograph (TEM) of a human T-lymphocyte cell. Here, the cell has released some of its cytoplasm (at bottom, yellow). The nucleus is coloured purple. This is a white blood cell, and one of the component cell types of the human immune system. T-lymphocytes (T-cells) differentiate in the thymus and move to the lymph nodes and spleen. Their defensive role in the cell-mediated immune response of the body is to fight invasion by foreign micro-organisms (notably viruses and some bacteria). T- cells can recognize foreign antigens and they release enzymes that destroy foreign invaders.